Last year I broke Larry Blasingaine's heart. For more than 40 years he believed he'd played guitar on the Jackson Five's first single, "Big Boy," a local hit released in January 1968 on Steeltown Records out of Gary, Indiana. I was the one who had to tell him he hadn't. But my research into the group's early history also led to the discovery of a tape no one knew existed—the Jackson Five's earliest professional recording. It predated the sessions for that first single by four months, and Blasingaine's guitar was almost certainly on it. An engineer restored the track this September, and since then its owners have been considering how and when to release it. I'd gotten in touch with Blasingaine (who also goes by Larry Abdul Hakeem) because I was working on a story about Apex, the Chicago studio where the Jacksons had recorded "Big Boy" for Steeltown. In July 2009 he gave an interview to Chicago soul historian Bob Abrahamian on WHPK, during which he talked about working with the Jackson Five to cut a version of "Big Boy" at a different studio, in the One-derful Records building at 1827 S. Michigan. At first I thought he was just misremembering, but soon I began to suspect that the group had recorded "Big Boy" twice in the summer and fall of 1967. The earlier recording was in all likelihood the one the 15-year-old Blasingaine, a child prodigy already working as a studio musician, had contributed to. But it had never been released, and the odds seemed overwhelming that it'd been taped over, lost, or destroyed in the decades since. In late July, when I explained this to Blasingaine, he was stunned. His voice cracked, and he could barely find words to deny it: "Naaaw, unh-uhhh." He stopped returning my calls and scolded Abrahamian for putting me in touch with him. Later he would tell me he'd suspected I was trying to use him to "checkmate" Pervis Spann, the legendary DJ who'd helped develop the Jackson Five, because I'd told him that Spann knew nothing about a "Big Boy" session for One-derful. Fortunately some better news soon came along. As I related in a September 2009 Reader cover story, in late August a thorough scouring of the One-derful archives turned up a spool of tape that appeared to hold the version of the Jackson Five's "Big Boy" that Blasingaine remembered recording. He was beside himself, and especially happy to learn that his memories of the session had prompted the search. But he still couldn't hear the music—the tape was too fragile, not to mention too potentially valuable, to play. One-derful's assets had been inherited by Eric and Tony Leaner and their sister Phyllis Newkirk—all children of Ernie Leaner, who founded the label with his brother, George. They spent a full year searching for a capable, trustworthy studio to restore the tape and digitally transfer its contents. In September 2010, when that work was done, the tape became more than just potentially valuable: it's now confirmed to be the first known studio recording by Michael Jackson, lost for 42 years. Soon I was finally able to make proper amends for the distress I had caused Blasingaine. Earlier this month, I arranged for him to be one of the very first people to hear it. Their paths would soon sharply diverge, but in 1967 and '68 Larry Blasingaine and the Jacksons were on parallel courses. 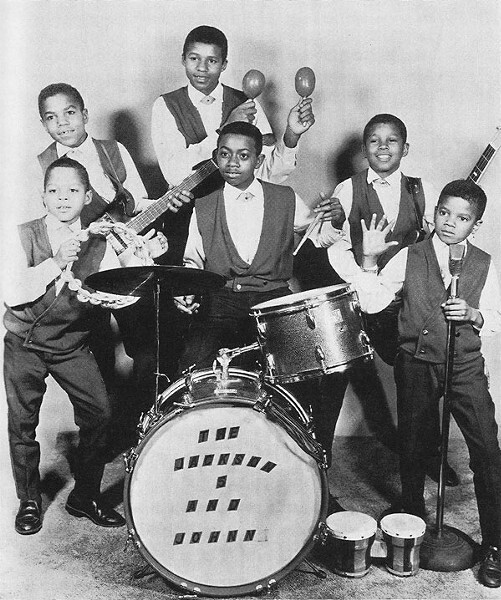 The Jackson Five and Blasingaine's group the Young Folks (they'd later record as Larry & the Hippies) shared a manager, gigged at the same Chicago nightclubs, like the Green Bunny and the High Chaparral, and sometimes shared equipment and rehearsal space when they had to prepare for one of Spann's showcases. But Blasingaine's interests and aptitudes destined him for a career behind the scenes. He'd dutifully studied music theory in grammar school and started his first band through a west-side youth-arts program called Teens With Talent, and his seriousness inspired adults to reach out and mentor him. Early on he picked up what he calls "tricks of the trade"—mostly tips about how to conduct oneself onstage—from members of the Red Saunders Orchestra. Saxophonist Eddie Silvers, the musical director at One-derful, taught him chord charts; One-derful producer Otis Hayes demystified engineering; and nightclub singer Hi-Fi White helped him understand Broadway-style arranging. Though Blasingaine's own singles were never hits, in 1968 he became the bandleader for popular sister act the Emotions. A year and half later—still in his teens—he started working as a sideman for R&B great Jackie Wilson. He quickly graduated to musical director, a role he held until Wilson's career-ending onstage heart attack in 1975. His most intimate encounter with the Jacksons was on July 13, 1967, when he entered the One-derful studio—by then his home away from home—and saw the Jackson brothers preparing for a session. They were working on "Big Boy," a tune Silvers had written. "When I came in, I was shocked," Blasingaine says. "It never did become a competitional thing, but I was just amazed that they were there at my studio. 'What are you doing here on my turf?' That's when Eddie approached me. He said, 'Larry, go in there and show Jermaine how to stop his bass from sounding boomy.' I went in and showed him how to use the fleshy part of the palm to hold on the strings, 'cause he was playing with his thumbs. And then Eddie said, 'Grab your guitar, I want you to play this part.' And that was that." And for more than four decades, that was that. For reasons they took to their graves, George and Ernie Leaner decided not to release their Jackson Five record. They sold whatever contract they'd signed with the group to Gordon Keith of Steeltown, who had the Jacksons recut "Big Boy" in November 1967—and that version would go on to sell 60,000 copies, by Keith's estimate. Meanwhile the One-derful recording was clipped from its reel, put on a hub, left on a shelf, and overlooked in every inventory of the label's stock—the most recent accounting, in July 2007, was conducted with Hayes, the engineer on the Jacksons' 1967 session. After the One-derful tape turned up last year, the Leaner heirs took a great deal of care deciding on the best way to restore and digitally preserve it. After researching studios online and soliciting recommendations from engineers and reissue labels, including local favorites the Numero Group, they ultimately chose to entrust the tape to Steve Puntolillo, who runs the Sonicraft A2DX Lab in Freehold, New Jersey. 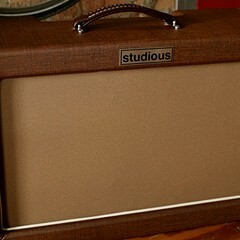 Sonicraft uses a museum's worth of vintage recording equipment alongside up-to-the-minute digital gear, and its past projects have included the restoration of session recordings Jimi Hendrix did before he got famous and assistance with the recent box-set reissue of Springsteen's Darkness on the Edge of Town—surely holy work for a Jersey studio. Tony Leaner, who lives in Maryland, drove the tape to Sonicraft on September 16 and stayed for the session. Puntolillo was impressed with the tape's condition, given its history—he didn't have to do much but remove surface contaminants, and he finished the job within a day. "It wasn't well cared for, but it responded really well," he says. "There was no degradation, no mold—sonically it's fine." Though Puntolillo was excited to hear the voice of the eight-year-old Michael Jackson, it was Leaner's reaction to the music that touched him most. "I was watching Tony," he says. "It was a really fun, kind of a joyous occasion, to see him discover that it really was there." The recording of "Big Boy," apparently the master from the session, was made on a four-track machine that used half-inch tape, though only three tracks had been filled. The music seems to have been cut live, with all the instrumentalists playing at once, but Michael's vocals—and what sound like two layers of background harmonies—were probably overdubbed. Puntolillo digitally archived the tracks, prepared a rough preliminary mix, and sent the tape and the mix home with Leaner. The Leaners are still pondering their next move, but it's practically a given that the song will eventually be properly mixed and commercially released—so far they've contacted a few boutique labels and Universal, which owns the rights to the Jackson Five's back catalog, but they've made no decisions. On Wednesday, December 1, I took Blasingaine and photographer Jim Newberry to meet Eric Leaner in a conference room on the 20th floor of Riverside Plaza, aka the old Chicago Daily News building on Madison. Leaner, who came of age after his family had left the record business, has had a job in this building for 23 years, working his way up from the mailroom, eventually becoming Sam Zell's personal driver and then a tax director for Zell's firm Equity Office (which was bought out by the Blackstone Group in 2007). 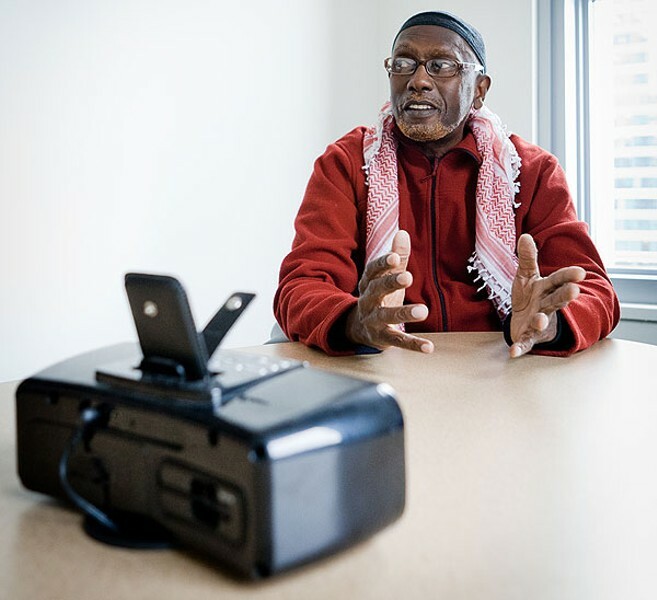 Before we arrived he'd moved a box of pastries off the conference table, replacing it with a small iPod dock. As we waited, he scrolled through his iTunes library to find the long-lost track. Though Blasingaine had been looking relaxed and sharp, his red-dyed goatee freshly trimmed for a high-profile gig with Syl Johnson the previous Saturday, in those last few moments he slumped forward and seemed to tense up. I'd already had a chance to listen to the song—Leaner had invited me to his office in October—but this was Blasingaine's first time. Given that he'd already had to abandon his cherished belief that he'd played on the Steeltown single, the stakes for him were high. What if, despite all the signs that pointed to yes, it turned out he wasn't on this one either? Finally the music poured out of the tiny speakers to fill the reverberant conference room. Within seconds of the first note Blasingaine sat up, a smile on his lips. "OK, that's it," he whispered. He grabbed an air guitar—the automatic gesture of a lifelong musician—and followed along with the rhythms of his part. "I played the chop," he explained. "At that time everyone wanted to play like Curtis Mayfield, and that was a popular thing, to reinforce the groove so they could dance." Seconds later, he cut in again: "That's what was missing—the organ!" One of the most noticeable differences between the One-derful "Big Boy" and the Steeltown version is the absence of the Hammond B-3 on the latter. The Jacksons wouldn't add an organ to their band till after they signed with Motown a year later, but there was one in the One-derful studio. Though it's unclear who played it, the part is just simple chords—Silvers or studio drummer Jimmy Jones could've handled it easily. "Remember I always said the quality [of the Steeltown record] was weak compared to how One-derful sounded?" Blasingaine reminded me. "What I notice about this session—I can't tell until I hear it on bigger speakers, but this seems more professional. The balance, the engineering, it sounds like it was produced . . . they took time to work with them, especially the voices . . . the backgrounds are stronger, Michael is clearer; it jells. It's what made them the Jackson Five—people were amazed by hearing them so young and being able to do that. And that's why I didn't understand when they said they had to go get some other musicians to play and sing." That "they" is Steeltown's Gordon Keith. He and Blasingaine met when I recruited them both for a panel I was assembling as part of a Michael Jackson symposium at Columbia College's Center for Black Music Research this September. At the panel discussion, Keith pointed out that he was the only person who'd had enough faith in the fledgling Jackson Five to release a record. They'd been championed by powerful players like Spann, considered by Curtis Mayfield's new Curtom label, and masterfully recorded by One-derful—but until Keith, no one had believed in them enough to test the market. But he was also wary of letting young kids do all the playing and singing on a single he was paying for. "I had faith in them," Keith explained at the symposium, "but not that much faith." Thus the only musician on both versions seems to be drummer Johnny Jackson, a gifted Gary teen Motown would later erroneously bill as a Jackson cousin. 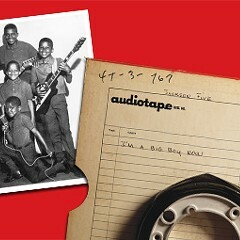 On the Steeltown "Big Boy," adult musicians from Gary replace Jermaine on bass and Tito on guitar. Michael also seems to be the only Jackson singing on the Steeltown side—a talented group of adults, Keith included, perform the background vocals. This is the most pronounced difference between the two versions, more significant than the organ, the varying levels of production polish, and the maturity (or lack thereof) in the musicianship. The unreleased One-derful track features the harmonies of Jackie, Tito, Jermaine, and Marlon, recognizable from their Motown hits—and because of these lively, youthful, familiar voices, it simply sounds more like the Jackson Five. "They underestimated them," Blasingaine muttered, shaking his head. "Listen to how strong that is. They could perform." We listened to the track again. This time I noticed that Michael's faux-improvised vocal riffing at the end of the song, which as a stage-seasoned nine-year-old he would cut almost exactly the same way on the Steeltown single, goes on a few seconds longer in this version—providing an extra bit of insight into his pre-Motown style. While the music played, I asked Blasingaine if it was shaking loose any specific memories. "I just remember the studio being crowded," he said. "I remember the daddy, Joe, was there, and the [Jackson] kids were in the southeast corner, in the back, coming around the drums, sitting in chairs. They never let us stand up to play—that was too distracting. Everybody sat down." Blasingaine requested yet another digital spin, and his recollections became more general. "It just brings back the memory of how it used to be," he said. "I remember the Hammond B-3 organ sitting in the back—we always wanted [Hayes] to bring up the volume on it so we could get a Jimmy Smith sound on it, but he never would do that for us. L.V. Johnson, Mighty Joe Young, Cash McCall, it was like an everyday thing to see these cats coming in. We was like a family. George [Leaner] treated us like he was our uncle or something. He let us take equipment out of the studio to use at shows. It was nice. Every now and then I have dreams about that situation. In fact, I just dreamed that One-derful Records had opened back up—Otis and everybody came back together, Jimmy had came back. . . . "
Then we listened to the Steeltown "Big Boy," hoping to figure out how Blasingaine could have taken someone else's playing as his own for so many years. "He's playing the same part I played," he explained. "Like I said, it was popular at the time, and at that time I had a Gibson—and listen, whoever played the guitar used a Gibson like I did." He turned his attention to the other instruments. "You can tell that's not the same model bass that Jermaine used. And his playing is more precise—oh, that was a tight turnaround!" he said, laughing. "That was slick—they would have had Jermaine working in the studio if he could do that!" In the past Blasingaine had been motivated to explain away such inconsistencies, of course, and the Steeltown version sounds similar enough to allow such self-deception because it was built on a recording he'd helped make just four months earlier. "We set the pace," he said. "The arrangement came from what we did at One-derful." It's impossible to say which "Big Boy" is better, especially for anyone with nostalgic ears accustomed to the Steeltown single, which became a beloved regional hit—its commercial success is one big reason Keith bristles at any suggestion that Motown "discovered" the Jacksons. The One-derful version sounds more like the Jacksons, thanks to the brothers' inimitable background harmonies and their earnest, exuberant, not-quite-professional playing. But the Steeltown version has relatively mature and polished vocals from Michael—for an eight-year-old, a few months of experience in the nightclubs of Chicago and Gary might as well be a lifetime. Still, Jackson fans curious about his development may find the earlier attempt more interesting. And Jackson fans will want to hear it—Blasingaine's biases aside, Silvers did a fine production job. The song is more than a demo or a historical curiosity. The Jackson Five's first studio session yielded a great recording. Leaner went back and played the One-derful version one last time, and Blasingaine listened with a slight smile on his face. It seemed he'd had enough time to feel the joy of hearing his younger self play and wax nostalgic about the old mentors whose handiwork shaped the song—now he was just drinking in young Michael's determined leads and his brothers' sweet harmonies. "That's real," he softly sighed, a far-off look in his eyes. "Real, pure Jackson Five." "I've been in Chicago for 4 years and must say that I've been disappointed with the apparent voluntary segregation mindset from all sides."